Based out of Queensland, Australia, the client is a well know Oil & Gas solutions provider with a rich 25-years of experience behind it. Working towards providing solutions that minimize risks, ensure high levels of safety, assured quality and reduces machine maintenance cost, the client has created a name for itself in the practical energy solutions market. The client designs tailormade solutions to meet unique project requirements that fully integrate with existing rigs or work as standalone solutions for sites with poor or no infrastructure. With growing list of international customers, the client provides concept designs, product life cycle management processes as well as prototype development and trail. The client is known for its practical designs that accommodate both basic as well as complex installation requirements over all aspects of product designs. 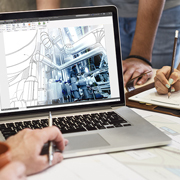 For one of their major projects to develop a more compact and handy Gas compressor package, the client was looking for an expert engineering services partner to help them create the product design. The entire package required change to accommodate various important safety and performance specifications as well as to make it more modular for easy maintenance. The challenged involved reducing the size and to accommodate each complex part into the new design without compromising on performance. At Outsource2india, the experience product development experts have provided appealing and workable product designs to a number on international clients that includes Fortune 1000 companies. For this project the team consisted of three product design experts as well as a team manager to ensure the design met all required specifications. List of specifications included changes to the piping, reduction of the skid size and to ensure space and size changes are clearly designs for easy serviceability. Not just about aesthetic designing, the package also needed to carry safety and operability features. The project was completed in 60 working days with weekly review meetings to discuss and incorporate changes as required. The team used Autodesk inventor and Acebrain to create the final design. Outsource2india is a pioneer in providing niche engineering support services that meet easy to complex requirements. O2I’s product design engineers come with the required knowledge as well as technical skillset that allows them to not just meet expectations but also provide vital value adds that help in the final product manufacturing. O2I follows strict ISO certified quality process that ensure each product design meets intellectual and physical requirements. Outsource2india works with you to design your products as an extension to your existing team. Contact us today for product design and development and see your ideas come to life.